Fair. Stains on sides. water damage **SHIPPED FROM UK** We believe you will be completely satisfied with our quick and reliable service. All orders are dispatched as swiftly as possible! Buy with confidence! Very Good. 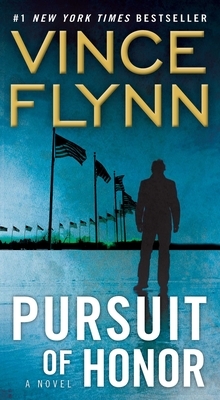 Pursuit of Honor (Mitch Rapp Novel) by Flynn, Vince. Mass market (rack) paperback. Glued binding. 403 p. Mitch Rapp Novel, 10. Good. Pursuit of Honor (Mitch Rapp Novel) by Flynn, Vince, 2010-08-31. Mass market (rack) paperback. Glued binding. 403 p. Mitch Rapp Novel, 10. Very Good. Deadly and charismatic hero Rapp wages a war against a new enemy, in this devastatingly intense thriller by "New York Times"-bestselling author Flynn. Sewn binding. Paper over boards. With dust jacket. 431 p. Mitch Rapp Novel, 10. All I can say is...as soon as I finished it I wanted the next installment NOW! Flynn is one of my favorites. He's even getting closer to "the King"...CUSSLER! This is a wonderful read. I definately recommend it. This is a great book and a great service. I will use this service again in the future. People have a right to pursuit of happiness. Mitch Rapp and Mike Nash stopped a group of terrorists before they could destroy the National Counterterrorism Center. 185 people died including some in congress and some in CIA. Three of the terrorists have escaped and have cut their ties with al Qaeda, making them harder to find. In addition, Mitch finds that there are a group of politicians who question his ways and feels that he is out of control. The characters are well developed. We know of Mike Nash's family and the manner in which his children react with Mitch, shows his human side. The dialogue is crisp and Flynn doesn't waste words. The plot is developed methodically. We see what the terrorists are doing as they plan their next attact and then view what Mitch is doing in order to stop them before more people are killed. In enjoyed the book but felt that the time Mitch had to explain his actions to naive members of congress took away from the flow of the story and lessened the suspense.